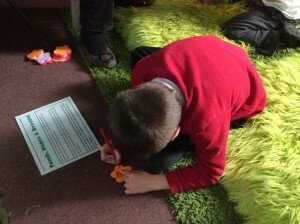 What a delight and privilege it was, writes Sr.Phoebe, to share for a short time in the PRAYER SPACE at Wantage Church of England Primary School that took place from 29 February till Friday morning 4 March. Children were in groups of 4, in little ‘tents’ in the Prayer Space, sitting on fluffy mats with an adult alongside, including the Vicar, Fr.John Salter & his colleague, Fr.Robert Teare. They were looking ahead to Holy Week and Easter. We talked about 4 special days: first the Hurrah Day (Palm Sunday). They were asked, ‘Have you had a Hurrah Day? Write a word about it on a paper palm leaf and hang it on a tree. Then, what things do you find hard? An anxious or scared time? Have you felt scared and worried? Share it with Jesus who felt like that in the garden. (Gethsemane). And Sorry Day (Good Friday), a sad day, a day for asking forgiveness, Jesus dying on the cross to take away our bad times and wrong doings. Tell him you are sorry. Put a fizzy tablet in a bowl of water, watch the bubbles come up and vanish as the tablet melts away. So Jesus takes our Sorry and the badness is all melted away. New Life Day (Easter) : what are you looking forward to? Chocolate Easter eggs? very nice – but a real egg is the place where a real live chick grows and comes out. Jesus came back with new life, for himself and for you. Sr. Valeria and Sr. Elizabeth Jane accompanied Sr.Phoebe to the Prayer Space and also found it creative.